Now 2017 is upon us, and with a new year comes new ideas and trends in home flooring. If you’re looking for something new to consider for your home this year, why not consider some of the following flooring choices? This is just a short list of some of the hottest options in flooring for the new year. Hardwood floors are known for their beauty and durability and have been a favorite choice of homeowners for centuries. However, recent trends in hardwood flooring have taken this age-old favorite and injected new life into it. Why not consider some of the following choices when looking for your next hardwood floor? 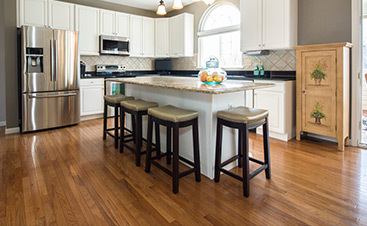 When thinking about hardwood flooring, most people don’t immediately think of cork. In recent years, though, cork has become one of the most popular choices, and with good reason. Cork is well known for its springiness and flexibility (just think about how a cork can change its shape to squeeze in and out of wine bottles). Springiness not only makes cork flooring durable and able to withstand wear and tear, but it also makes it more soft and comfortable to stand on for long periods. Cork is also a greener option, as it is harvested from the barks of trees that grow back over time, which makes it a very renewable resource. Maybe the most important aspect of all: cork’s natural appearance makes for a beautiful and uniquely textured finished. Bamboo is another wood that many people don’t immediately think of because it is technically not wood at all. Bamboo is a type of grass. However, when harvested and prepared correctly, bamboo can be as strong and durable as oak. One of the great advantages of bamboo (besides its strength) is that it’s available in a wide variety of colors and designs. Bamboo can fit into any style of the room. In addition to this, it is also a cinch to maintain, as it can be wiped down with a damp cloth, mopped or even treated with a bamboo floor cleaner. Recent interest in vintage stylings has made classic furnishings a hot new trend, and flooring is no exception. However, unless money is no option, finding complete old floors to reclaim can be incredibly impractical. The next best thing? New floors that are created to have that older reclaimed look. The best part about this option is that, even though it is designed to emulate old wood, this wood comes with all the benefits of brand-new floors, including durability and integrity. Faux reclaimed flooring comes with a much more affordable price tag, as well! If you’re thinking about going in a different direction, tile floors have many of the advantages of wood, including strength, durability, and beauty. In some ways, tile offers even more in the way of design options. While people typically think of tile as being available in smaller squares (1’ x 1’ or possibly 18” x 18”), the hottest thing going on right now in the world of tile is the fact that both ceramic and porcelain tile can be produced in much larger, thinner sheets (in some cases, all the way up to sizes as large as 6 feet by 12 feet and only a few millimeters thick). This lets you have even more options when it comes to where and how to use tile. Another big trend? New printing technology lets tile look like many other popular and varied materials. 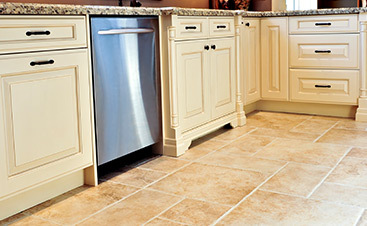 This means that, with a little creativity, you can use tile to make your floor look like just about anything you want. This is an option you probably didn’t even know was available: tile with a metallic sheen. While this might not be your first choice for a living space, this tiling works well in bathrooms or as accents. Available in a variety of colors, this choice gives your floor (or wall!) a unique flair that will be noticeable. Another design choice that is fairly new and still relatively unheard of: a tile that is designed to replicate the textures of fabrics such as linen or silk. This gives you the strength of tile, but a warm, cozy, comfortable-looking appearance that can help give your room a much softer appeal. While not a new thing, wood-mimicking tile is a hot trend these days, and why not? 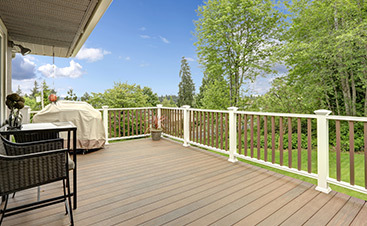 You get the beauty of a hardwood floor, but since the item is made of harder tile, it is the strongest, most durable and longest -lasting flooring material available. So, you’re getting the best of both worlds with a choice like this. As you consider your options for your flooring project this year, take a look at all the choices available to you. While going with an established, classic style is never a bad choice, there’s nothing wrong with being on the cutting edge, either. With styles like these available, you can get just about anything you want for your rooms, which will help ensure that your place is the place to be in 2017.